* Class is Full-Size Vans based on Ford segmentation (based on body type, body length, wheelbase and roof height). **When properly equipped. † Based on total U.S. reported sales (2017 CY). Best-in-class vehicle confi gurations. * Available seating confi gurations for up to 15. Transit Passenger Wagon offers three roof heights, three body lengths and three engine choices to meet your specifi c needs. And you can get up to 100.5 cubic feet of cargo space behind the last row of seats. ** Exactly what you'd expect from America's best-selling full-size commercial van. 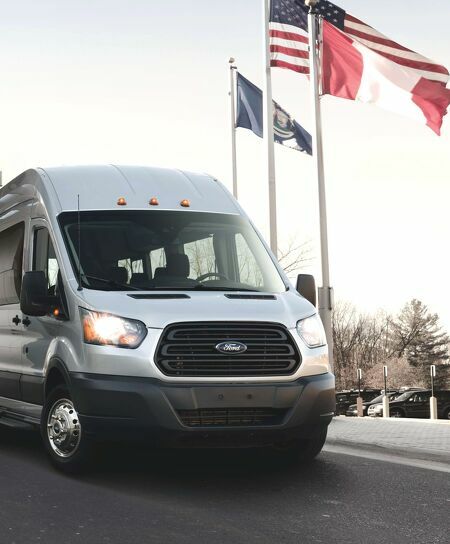 † FORD.COM /// THE FORD TRANSIT FIRST-CLASS PASSENGER COMFORT FOR UP TO 15 IT PUTS YOUR BUSINESS IN THE DRIVER'S SEAT.